My father was an engineer … analytical. Engineers, mathematicians, financiers, scientists and many other professions are thankfully analytical. That typically means personalities driven by detail, logic and task rather than people orientations. 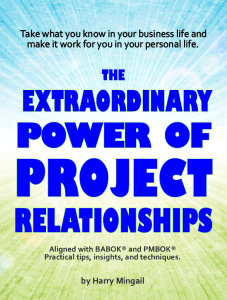 This week I will be delivering a 3 day workshop, which includes several engineers, on leadership and interpersonal skills, based upon my audio and e-book “The Extraordinary Power of Project Relationships” (see video http://www.youtube.com/watch?v=Y0UWBGgZ7eI ). So here’s a reference to a great article entitled “5 Must-Have Soft Skills for Engineers’ Career Success” which aligns 100% to the 3 day workshop I will be delivering. We need you engineers and people from analytical careers.